This year marks the 1200th anniversary of the Shikoku Henro, the route that follows the footsteps of Kōbō-Daishi Kūkai through Mt. 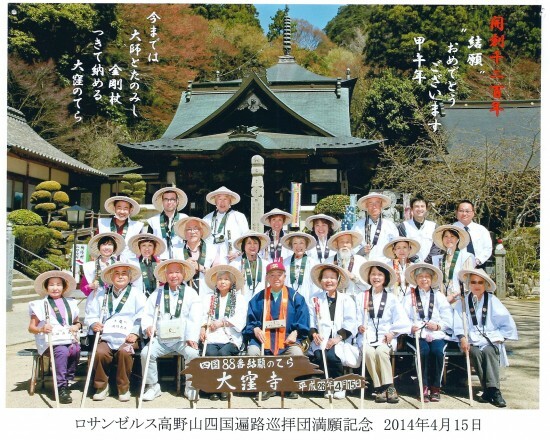 Koya and 88 temples in Shikoku. Koyasan Buddhist Temple of Los Angeles finished its 2014 pilgrimage on April 15, led by Bishop Emeritus Taisen Miyata, the author of the English-language guidebook “A Henro Pilgrimage Guide to the 88 Temples of Shikoku Island, Japan.” This was Miyata’s 12th time to make the trip. Traveling by chartered bus, the 23 pilgrims covered 900 miles over the course of seventeen days. Tour members came not only from Southern California but also from out of state, as far as Colorado and Taipei; their average age was 70. They enjoyed the trip without any injuries or accidents.